Harry Appleby was born in Yeovil in 1866, fourth of the eleven children of house painter and glazier Josiah Appleby (1839-1886) originally from Babcary and Louisa née Gear (1833-1919) originally from East Coker. In the 1871 census the family were listed living in Chant's Path, Yeovil, and 5-year old Harry was listed as a scholar. By the time of the 1881 census the family had moved to Brunswick Street and Harry, by now aged 15, was working as a servant but living at home. In 1887 Harry, a member of the Yeovil YMCA, read a paper entitled 'Temperance' at a meeting and in 1888 it was noted that Harry was a member of the Yeovil branch of the Congregationalist Band of Hope. In the autumn of 1889 Harry married Louisa Pudden (b1861) at Fulham, Middlesex. Louisa, from East Coker, was the daughter of builder Edward G Pudden (b1816) and his wife Louisa (b1823). Harry and Louisa initially lived in Castle Cary where their son Bertram Pudden was born in 1890. In the 1891 census Harry, Louisa and Bertram were listed living in High Street, Castle Cary, and Harry gave his occupation as a Monumental Sculptor and Louisa gave hers as a Dress & Mantle Maker. In 1892 Harry, described as 'H Appleby of Castle Cary' entered into partnership with George Childs described as 'G Childs of Yeovil ' and the firm of Appleby & Childs, Monumental Masons & Sculptors 'at Yeovil and Castle Cary' with 'Branches at Gillingham and Somerton' was born and announced in the Western Gazette's edition of 1 July 1892 - see below (I'm not sure where the A&C website gets their founding date of 1886 from). Harry and Louisa had a daughter, Ethel, who was born in Castle Cary in 1893 but the family then moved to Yeovil where the rest of their five children were born; Dorothy May (b1895), Gertrude Clara (b1898) and Ivy Hilda (b1900). In the 1901 census Harry, Louisa and their children, together with Harry's elderly Aunt Ann and a servant were living at 71 Middle Street, above the premises of Appleby & Childs - George Childs and his family lived next door at 72 Middle Street, also above their premises. By 1911 Harry had moved his family to Penn Hill, where they lived at Glen View. Both Harry and his son Bertram gave their occupations as Monumental Sculptors. Harry died in Yeovil in the winter of 1918. He was 52. George Childs was born in 1859 in Montacute, the son of Stone Mason Charles Childs (1826-1911) and his wife Jane née Eglen (1827-1907), both of Montacute. In the 1861 census the family were listed in the Borough, Montacute, and the family were still there ten years later. By 1881 Charles and Jane, together with 21-year old George, were living in Middle Street, Montacute. Charles gave his occupation as a Stone Cutter, Jane gave hers as a Boot Binder and George listed his as a Marble Mason. In the winter of 1886 at Yeovil, George married Frances Ellen Burnett and they set up home in Yeovil where their daughter Florence was born in 1889. George and Frances were to have another five children; Charles W (b1892), Ethel Ellen (b1892), Ernest G (b1896), Edith A (b1900) and Linda (b1901). In the 1891 census George and Frances, together with Florence, were living at the "Stone Mason's Shop" near the Wesleyan chapel in Vicarage Street. George gave his occupation as a Monumental Sculptor. 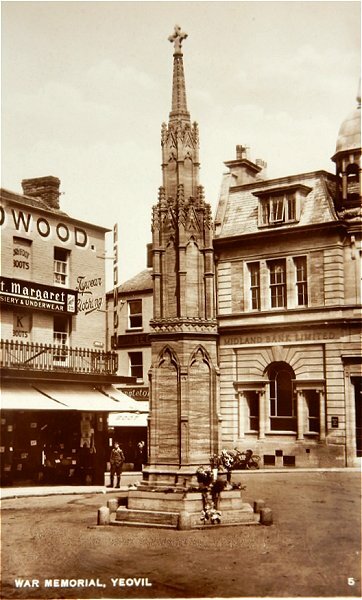 By 1895 George was in partnership with Harry Appleby and the firm of Appleby & Childs, Monumental Masons & Sculptors of Middle Street was established. 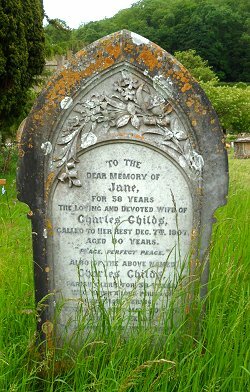 At left is the headstone of Charles and Jane Childs - it would be nice to think that George carved this memorial in the churchyard of St Catherine's church, Montacute, to his parents. In August 1896 George found himself in court at the Petty Sessions, summoned for not having Ethel vaccinated "according to law". George stated in his defence that one of his children who had previously been vaccinated became very ill and he was now afraid of the consequences of vaccination. The Bench replied that they had to carry out the law, not make it. Ethel was subsequently vaccinated. In January 1901 George found himself in court again, but this time as a witness since George Knapton, formerly a Yeovil grocer, had forged George's signature on four promissory notes amounting to £115 (over £70,000 at today's value). Knapton was committed for trial. In the 1901 census George, Frances and their children, together with two servants and a boarder were living at 72 Middle Street, above the premises of Appleby & Childs - Harry Appleby and his family lived next door at 71 Middle Street, also above their premises. By 1911 George had moved his family to Penn Hill, where they lived at Penn Cliff. In the census George gave his occupation as 'Monumental Mason Manufacturer' and 19-year old Charles Wilfred gave his as a Letter Cutter. Ethel was a Pupil Teacher and the remaining children were listed as scholars. George died on 12 October 1948 aged 89, and his will was proved the following March. His estate was valued at £12,280 17s 10d (about £1.5 million at today's value). As mentioned above, Harry Appleby and George Childs went into partnership in 1892 as Appleby & Childs, Monumental Masons. At this time Harry's premises were in Castle Cary and George's premises would have been the "Stone Mason's Shop" near the Wesleyan chapel in Vicarage Street, above which George lived with his family. 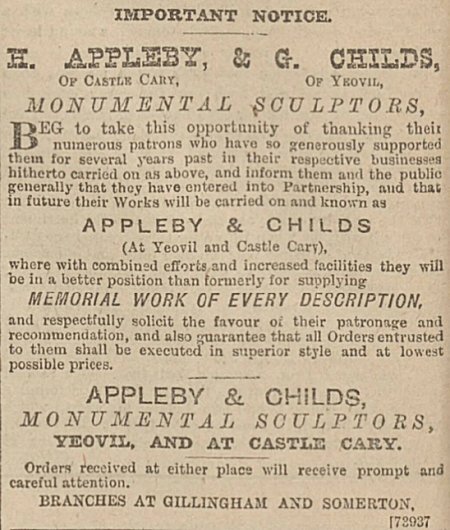 In 1895 Appleby & Childs were advertised in Whitby's Yeovil Almanack Advertiser as Stonemasons of Middle Street and by 1897 they were advertising their services in newspapers (at the end of the "Births, Deaths & Marriages" notices) with premises at Yeovil, Weymouth and Bournemouth. Appleby & Childs appear regularly in Yeovil trade directories as Monumental Masons of Middle Street from Whitby's Yeovil Almanack Advertiser of 1898 until their 1954 entry in Edwin Snell's Directory of that year. The firms' most well-known work must be the War Memorial in the Borough. Designed by George Child's son, Charles Wilfred, by this time an architect, and carved by Appleby & Childs at a total cost of £1,250 (about £52,000 in 2017's value). The 29 foot high memorial was based on the 'Eleanor' crosses erected by King Edward I in memory of his wife, Eleanor of Castile, to mark the nightly resting places along the route taken when her body was transported to London in 1290. Today Appleby & Childs operates from the Pen Mill Trading Estate. The announcement of the new company Appleby & Childs in the 1 July 1892 edition of the Western Gazette. 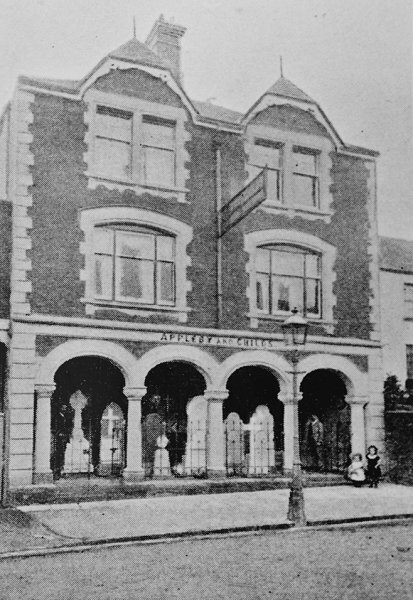 Appleby & Childs' premises in Middle Street, photographed in 1898. 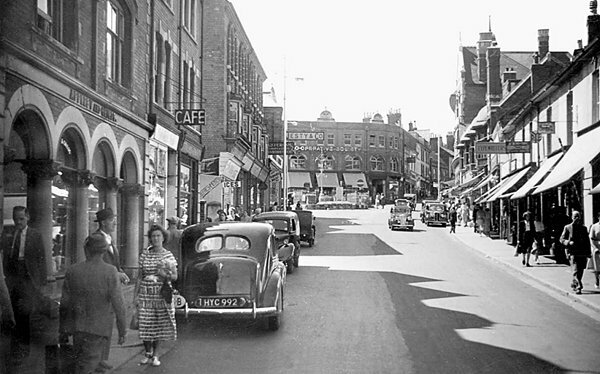 Middle Street looking west towards the Triangle in the mid-1960s. Appleby & Childs premises are at extreme left. This postcard from the early 1920s, shows the War Memorial in the Borough - almost certainly Appleby & Childs' most well-known work. The 29 foot high memorial was designed by architect Charles Wilfred Childs, the son of George Childs, and sculpted in Ham stone by Appleby & Childs at a total cost of £1,250 (about £52,000 in 2017's value). 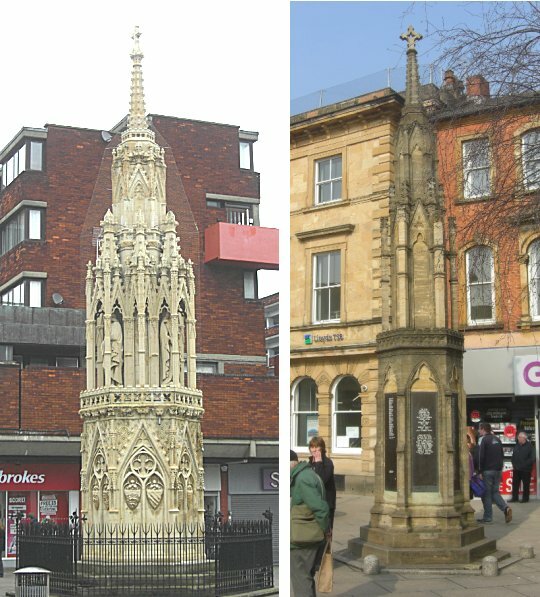 A comparison photograph of an original Eleanor cross, erected between 1291 and 1294 at Waltham Cross in Hertfordshire (just a mile from where I grew up) at left, and Yeovil's War Memorial in the Borough that owes its design to the original.